Very early in my career here, I recognized the value of a strong safety program and guide training. I know that one of the things that I am the proudest of regarding Riverview is our emphasis on safety. We wrote and produced our own safety video that we have each group watch in their cottage. This video lasts just under seven minutes, which I determined years ago to be the length of the attention span of an executive. That is followed up the first morning with an individual safety lecture to each group. You may wonder why we do that when most everything we say in our safety talks are in the video. Well, that goes back to that old tried and trusty management tool of spying and eavesdropping. I have peeped through the window and watched a party of six while they watched our safety video. Usually two are talking on their cell phones while one guy is not even in the room, and three are intently watching. When we have you penned in a private dining room and the last biscuit is eaten and the door is closed, we have your attention. Aaron was never a big talker, but when he had something to say, it was worth listening to. I want to mention two of my favorite stories concerning Aaron before returning to guide training. We once had a guide call in and ask for more shotgun shells to be delivered to him in the field. Aaron and I drove out to the course, and as we were walking toward the hunters, a stray single flushed straight at us. One of the hunters mounted his gun and took a bead on both the quail and us. As an old guide, Aaron whirled around, squatted and turned his back to the hunter. Since I saw absolutely no need in both of us getting shot, I did the same thing, but I put Aaron between me and the hunter. Thank goodness, the guide was able to call the guest off of the shot, but I had many a baleful glance from Aaron for the rest of the day. On another occasion we had a host that was not particularly happy about something, and asked for Aaron to come to his cottage to discuss it. As Aaron was pulling up , a huge White Oak Runner snake was about to crawl into their cottage. This is a non-poisonous snake. Aaron grabbed him by the tail, but the snake was able to bite him. Aaron calmly broke the snake’s neck, sucked the blood off of his hand, and flung him out over the river. He then just as calmly turned to the host and asked him what he could do for him. The host’s response was, “It’s not really important after all.” That night at dinner, the host told me that he wasn’t about to complain to that man about anything—EVER. Meanwhile back to guide training—Our new guides, and we have precious few new guides, go through an at least two month training program in which they have to demonstrate and pass several key tests. Two situations convinced me in my early years to write a guide training program, and to put it in practice. 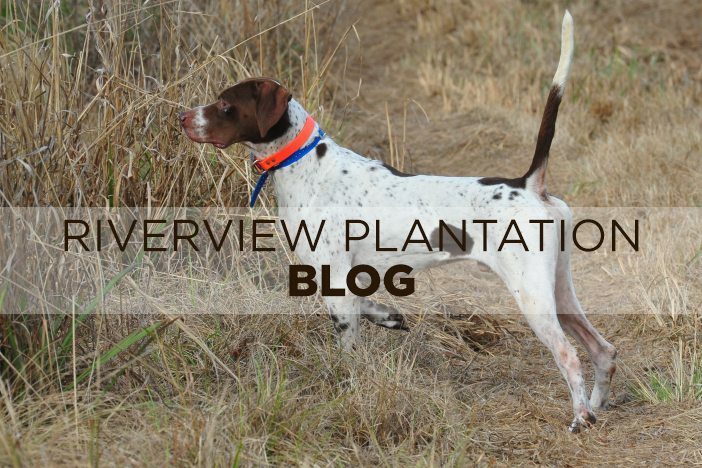 The first instance was when I overheard a guest ask a guide how in the world the bird dogs located the quail. His response was that bird dogs have really good eyesight. Uh, I had just assumed that anyone would know better than that. The second instance was when a guide called me on the radio to come pick up a sick dog. When I got to his hunting course, he was dragging the dog away from the guests as hard and fast as he could. “What’s wrong with the dog,” I asked. His reply, “There is nothing wrong with the dog, but I am lost.” I have been riding around this one little field for 30 minutes, and my guests are beginning to smell a rat”. I pointed out a little narrow trail in the southwest corner of the field and told him that when he went down that hill, his entire course would open up to him. He was so grateful, and started heading back to the jeep leading the dog with him. I had to call out, “wait a minute, Bubba, you have to leave the dog with me because he is sick. Don’t you remember?” “ But that’s one of my best dogs,” he whined. I said he should have thought about that before grabbing him, but a good lie has to be believable. At any rate, he found his course, and had a really good hunt. I believe that these two occasions both occurred in 1972. The next year was when I began writing a training manual, and instituting a much more intensive guide-training program. One of the reasons that we will not book a full house during the first three weeks that we are open is that we will not throw a first year guide to the wolves until he has gone through all of the manual and field work, AND has passed his trial hunt which consists of managers or executives of this company pretending to be guests on his jeep. They will not let me go on the trial hunts anymore as the new guides claim that I make them more nervous than a paying guest. C’est la Vie!